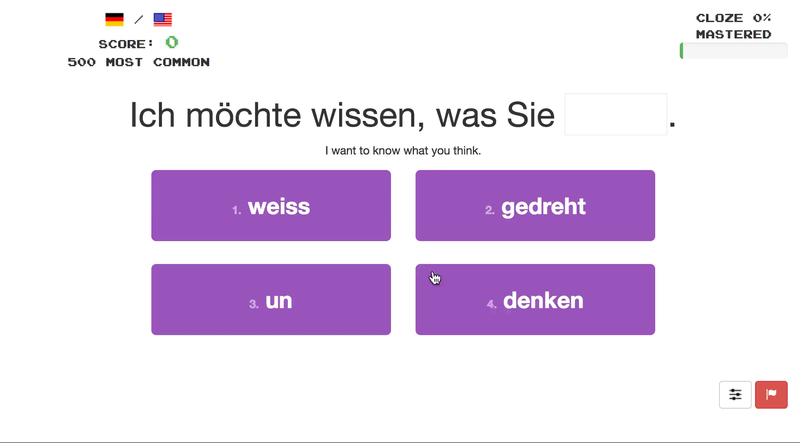 Clozemaster is language learning through mass exposure to vocabulary in context. No more single word flashcards. No more guessing how a word is used. Learn vocabulary in context by filling in the missing word for thousands of sentences. More than 50 languages available. And over 170 language pairings. Learn German from English, Portuguese from Swedish, or Russian from French. See them all. Score points and work your way up the leaderboard. Master sentences via spaced repetition. Track your progress by word frequency. Free to sign up and play. Clozemaster Pro subscribers get access to advanced features and stats - but everything you need to learn fast is free and always will be. Get started. Ready to take your language learning to the next level?